There are times when you do everything right (sleep long enough, drink a lot of water), but you can still see dark circles when you look in the mirror. Then you can do two things. The first thing is to apply a de-puffing cream, such as Clark’s Botanicals Anti-Puff Eye Cream and the second thing is to learn how to camouflage them correctly. We visited James Vincent. A celebrity makeup professional, and asked him to tell us his camouflaging tricks. When puffiness is present you should go darker with your concealer. He explained that you should apply a darker colored concealer if puffiness is present. The reason for that is that a darker color will make something look smaller or deeper or recess something. He said that you can pull the puffiness back, helping it blend with the rest of your skin by applying a darker color. You should use concealer only where there is discoloration. When applying concealer you should restrain a bit. Vincent explained that you won’t camouflage your dark circles if you apply concealer in the whole under-eye are. In this way you will only accentuate them. You should apply your foundation and then your concealer. 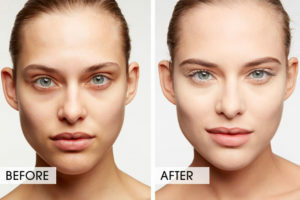 Many women think that they should apply concealer and then foundation, but that is wrong. Vincent recommends that you should apply your concealer after your foundation, because the foundation will provide some coverage and in this way you will use less concealer. When there are deep lines you should go lighter with your concealer. Vincent said that you will bring something forward or open something by applying a lighter color. When choosing your concealer’s color you should be cautious. Vincent recommends that you should use a concealer which has an undertone which is opposite color of discoloration. He explained that this means something in the orange family – a salmon, peach or coral colored concealer. He also said that you shouldn’t use yellow-tone concealers because they can make your under eye discoloration appear grey. Vincent explained that when you combine yellow with blue under your eye, it becomes green, leaving that grey cast which many women encounter.